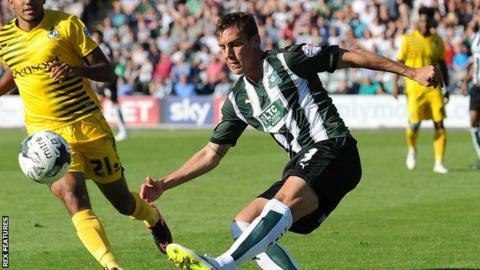 Plymouth Argyle defender Gary Sawyer hopes the club can use their good form in League Two to go on a long run in the FA Cup. The Pilgrims are five points clear at the top of League Two and host Carlisle in the FA Cup first round on Saturday. Sawyer was part of the Plymouth side that reached the quarter-finals back in 2007, when they lost 1-0 to Watford. He said: "If we stay like we are then we're very hard to beat. I don't know how far but I hope we go really far." Sawyer's first taste of the FA Cup came as a 19-year-old while on loan at Exeter City, when he played in the side that famously drew 0-0 with Manchester united in the third round in 2005 before losing the replay 2-0. "It's probably the thing that put my name on the map when I was younger," Sawyer told BBC Radio Devon. "When you play a big side when you're so young, it does set you up to deal with crowds and things like that. "The spirit of the FA Cup's great, so it'd be nice if we could do well in it and maybe draw a big side." But the 30-year-old still sees the loss at home to Watford in March 2007 as his chance that got away. "That's one I look back on and am a bit gutted with because I feel we should have won that game," he said. "That was really far on in the FA Cup. That was a great feeling and we had a good side at that stage as well, and that is one that got away from us really, we should have won that game."